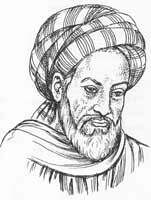 Abu Rihan Muhammad bin Ahmad al-Biruni - Khwarezmian Muslim intellectual and polymath - was the greatest scholars and writers of his age. In 1017 CE, for the first time he travelled to the Indian subcontinent as part of the invading armies of Mahmud of Ghazni and, in course of time, became one of the most important interpreter of Indian science to the Islamic world. He is given the titles the “founder of Indology” and one of the “first anthropologist”. He was considered an impartial writer on custom and creeds of various nations, and was given the title al-Ustad or ‘The Master’, for his remarkable description of early 11th-century India. He was the author of a monumental work on India called Tehqiq ul-Hind or the Researches on India, also known as Kitab ul-Hind or Book of India, which he completed 1030 CE. The full title of this work reads Tehqiq ma lil-Hind min Maqoolah Maqboolah lil-Aql wa Marthoolah (literally, Critical study of what India says, whether accepted by reason or refused). It presents a critical, sincere, and concise view of Hinduism and Indian culture. Arabic and Persian literature prior to al-Biruni's time had depicted India as a land of wonders. The Indians were knowledgeable in astronomy and arithmetic; they were said to have invented chess, which in al-Biruni's time was already considered an intellectual game; they were accomplished sculptors and poets; their doctors were highly reputed, and it was even affirmed that the science of philosophy had originated in India. Many people before al-Biruni had travelled to India, especially to Sind and its southern coast, and some books that could serve historians as a guide to studying the country had been written. AI-Biruni's monumental work on India, however, clearly demonstrated a scientific, that is, objective approach to the subject. In this work, al-Biruni has quoted 24 works by 14 Greek writers and used 40 Sanskrit sources. It covers Indian caste system, philosophy, the exact sciences, religion, laws, customs, superstitions, legends, the system of weights and measures, the written language and geography, to name just a few major components. Thus for the first time a bridge was established for those Muslims who wanted “to converse with the Hindus, and to discuss with them the questions of religion, science, or literature, on the very basis of their own civilization." To bring home the apparent contrast between the two civilizations and cultures, al-Biruni begins his Tarikh ul-Hind by commenting on the differences between the Hindus and the Muslims. In the first Chapter titled 'On the Hindus in General, as an Introduction to Our Account of Them’ he observes that "the Hindus entirely differ from us in every respect." First and foremost al-Biruni explains the difference in the language spoken by the two. “…. we first mention the language, although the difference of language also exists between other nations” he adds, and asserts that Sanskrit is a language “of enormous range, both in words and in inflections,” in which one and the same thing is called by various names, both original and derived, and uses one and the same word for a variety of subjects. He warns the readers that unless one knows the context in which the particular Sanskrit word is spoken it would be difficult to understand its meaning. He also noted that some of the sounds of consonants are neither identical nor resemble with any sound in the Arabic and Persian languages. Al-Biruni also marvelled how beautifully the Hindus write their scientific books in metrical form, so that they can be committed to memory and thus prevented from corruption. “The Hindus call their castes varna, i.e. colours, and from a genealogical point of view they call them jataka, i.e. births. These castes are from the very beginning only four. The highest caste are the Brahmana, of whom the books of the Hindus tell us that they were created from the head of Brahman. And as the Brahman is only another name for the force called nature, and the head is the highest part of the … body, the Brahmana are the choice part of the whole genus. Therefore the Hindus consider them as the very best of mankind. The next caste are the Kshatriya, who were created, as they say, from the shoulders and hands of Brahman. Their degree is not much below that of the Brahmana. After them follow the Vaishya, who were created from the thigh of Brahman. The Shudra, who were created from his feet. "Several circumstances, however, compel us to attribute globular shape to both the earth and the heaven, viz. the fact that the stars rise and set in different places at different times, so that, e.g. a man in Yamakoti observes one identical start rising above the western horizon, whilst a man in Rūm at the same time observes it rising above the eastern horizon. Another argument to the same effect is this, that a man on Meru observes one identical star above the horizon in the zenith of Lanka, the country of demons, whilst a man in Lanka at the same time observes it above his head. Besides all astronomical observations are not correct unless we assume the globular shape of heaven and earth. Therefore we must declare that heaven is a globe, and the observation of these characteristics of the world would not be correct unless in reality it were a globe. Now it is evident that all other theories about the world are futile." "Mountains, seas, rivers, trees, cities, men, and angels, all are around the globe of the earth. And if Yamakoti and Rūm are opposite to each other, one could not say that the one is low in relation to the other, since low does not exist…. Every one speaks of himself, 'I am above and the others are below,' whilst all of them are around the globe like the blossoms springing on the branches of a Kadamba-tree. They encircle it on all the sides, but each individual blossom has the same position as the other, neither one hanging downward nor then other standing upright." "For the earth attracts that which is upon her, for it is the below towards all directions, and heaven is the above towards all directions." Similarly, on the topic of ocean tides, al-Biruni wrote that the educated Hindus determine the daily phases of the tides by the rising and setting of the moon, the monthly phases by the increase and waning of the moon; but hastens to add that the physical cause of these both phenomena is not understood by them. “Those, however, who go beyond the thousand in their numeral system are the Hindus, at least in their arithmetical technical terms, which have been either freely invented or derived according to certain etymologies, whilst in others both methods are blended together. They extend the names of the orders of numbers until the 18th order for religious reasons, the mathematicians being assisted by the grammarians with all kinds of etymologies. "To al-Beruni the Hindus were excellent philosophers, good mathematicians and astronomers, though, out of a certain self-confidence, he believes himself to be superior to them, and disdains to be put on a level with them. He does not conceal whatever he considers wrong and unpractical with them, but he duly appreciates their mental achievements… ." Al-Biruni with his writings on India and Indian Culture, provided a key to his contemporary scholars to open the gates of knowledge that India was potential to share with the world.